Sacmi is also a champion when it comes to logistics! After attracting the attention of international investors with high performance plant engineering solutions for beverage production lines, the Group will soon be presenting – at Drinktec 2013, the world’s biggest fair dedicated to drink and liquid food process, bottling and packaging solutions – the first ‘automated magazine’ for preforms and caps, thus completing its turnkey plant engineering range which covers everything from raw material intake to end-of-line solutions. 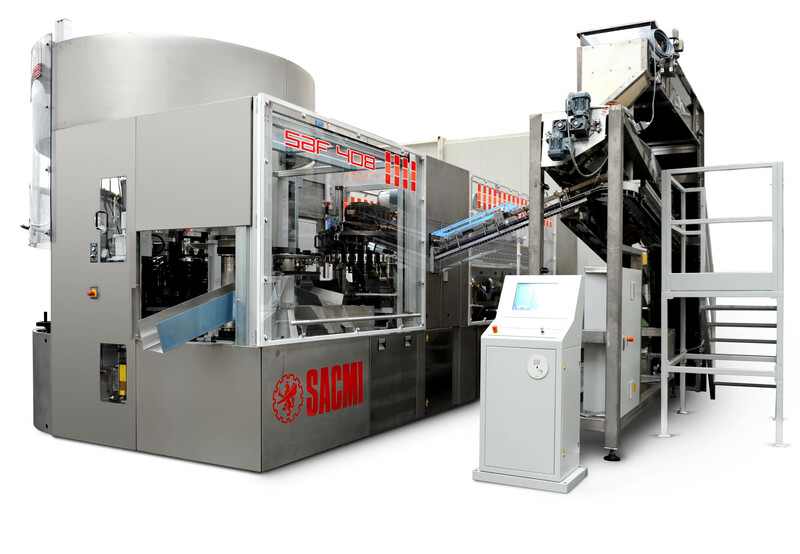 ‘Enjoy completeness’: this, then, is the slogan that effectively conveys the idea behind this Sacmi solution, which integrates cap production (CCM 48SC) and preform production (IPS 220B) with the bottling line (Combo EWE 10/15/15 + FORMSLEEVE+) via a highly automated dynamic buffer (CPB LINK), all within the scope of a wider energy-saving programme (HERO). For the very first time, visitors will be able to get a direct look at the entire production line in action and see the outstanding performance of the individual machines making up that line, starting with cap and preform production. With Sacmi CPB LINK, storage and subsequent feed of caps and preforms to the bottling section become part of a single process, fully automated and smoothly integrated, allowing logistical costs to be cut considerably while simultaneously raising bottling hygiene standards thanks to the heat and microbiological treatment executed by the buffer. In keeping with other solutions showcased in recent years Sacmi will be at the fair, from 16th to 20th September 2013, to propose not just one individual innovation, no matter how significant it might be, but a comprehensive ‘tour’ (covering a surface area of over 1,000 m2, stand 302, hall B5); this will take visitors through product and packaging material analysis in a dedicated R&D area, equipped with cutting-edge instruments, through the beverage plant and then on to the ‘workshop’ where they can take a close look at the latest technological solutions for filling and cap/preform production. In this last area, industry experts can assess the performance of the impressive CCM 48SC, the press which embodies all the advantages of that compression technology with which Sacmi has profoundly innovated the closures sector. The model exhibited at the fair is an all-new one (specially designed to be optimised with COOL+, Sacmi’s innovative enhanced mould cooling solution); with a cycle time of less than 1.5 seconds, it can provide output rates of up to 2,000 caps per minute with just 48 cavities, thus boosting productivity by 50% compared to CCMs with traditional moulds. Drinktec visitors will be able to appreciate this high performance solution in a production demonstration of 29/25 still water caps weighing 1.3 grams. The same ‘workshop’ area will also house the IPS 220B, a new-concept injection press for preform production that draws on the Sacmi Group’s decades of experience in the industry, combining it with the innovative double-cavity stretch blowing technology of the SBF 410. All exhibited machines will be equipped with Sacmi CVS3000 Quality Control systems, smoothly incorporated on the CCM 48SC and the SBF 410. More specifically, the IPS 220B will use the Sacmi PVS 002B inspection unit, capable of analysing up to 1,200 preforms an hour via a sampling system that picks preforms at set time intervals and, where defect-free, returns them to the production cycle. As regards Filling, the new generation of high-tech filling valves,able to meet every possible requirement in terms of both product to be filled and technology, will also be on display: the exhibited machine will be equipped with contact-free electronically controlled EWE valves that are also suitable for highly sensitive still products. At the fair we’ll also be showcasing the all-new aseptic filler from the BAG-IN-BOX range, specifically designed to handle very high quality products. To complete the picture there will also be roll-fed labellers; as the name implies, these allow labels to be applied directly from the roll of film.The Sacmi labeller rangehas been profoundly innovated in recent months, the top-of-the-range model now being the Formsleeve+, the new modular labeller featuring even more versatile design and more flexible material choice and control. Starting from the roll, the Formsleeve+ labeller forms the sleeve directly in the machine using natural resins; the sleeve is then heat-shrunk (by upto more than 50%) in the machine outlet tunnel, thus ‘dressing’ the container with partial or complete sleeves. The thus-designed application is so efficient it can reduce plastic roll costs by up to 20%. Drinktec 2013 also offers a perfect opportunity to observe the potential of on-cap digital printing and see how this technology is opening up new communication and marketing frontiers even on surfaces as small as those found on caps.